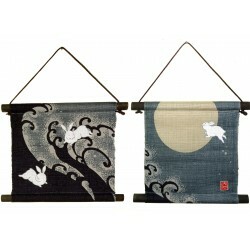 Set of 2 hanging tapestries 20 x 20 cm. 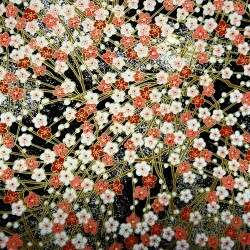 Stenciled dyeing (katazome) and hand painted. "Nami Usagi" (rabbits and waves) is a traditional Japanese theme. It represents the prosperity and the desire to go ahead, as a rabbit can jump, even further by bouncing on the waves. 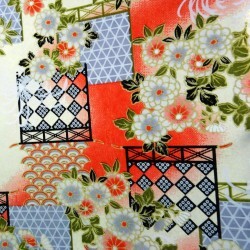 Techniques applied for the motifs dyeing: Katazome (batik like): a resist paste made of a rice flour mixture is applied through a stencil using a brush or a tool such as a palette knife. Once dried, pigments and colors are hand painted.